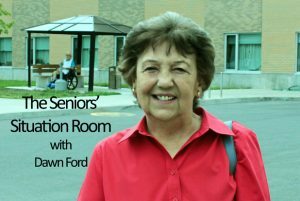 Cornwall Ontario – When you start to hear Ed Lauzon sing a song such as ” I Just want To Dance With You”, you can’t help but want to sing along and get up and dance. Ed and two of his sons, Ed. 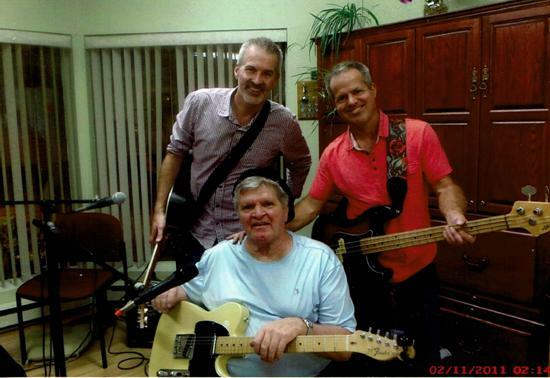 Jr. and Adam recently entertained the tenants and friends of Beek Lindsay Seniors Residence with another wonderful concert. It was such a treat to hear the old familiar songs all of those attending knew so well. Some of the songs were:” When My Blue Moon Turns to Gold Again, Devil Woman, Unchained Melody, Who Stopped the Rain?, Under the Boardwalk, Earth Angel, City of New Orleans, The Wanderer, Stay By Me Diana, and Sunday Morning Coming Down”, and many more. With a list like that, who wouldn’t enjoy a wonderful evening!! People were up dancing and line dancing to some of the songs as well as others singing along. Ed sang two songs that he had written which were enjoyable and humorous, making everyone laugh. Some of the residents said that the concert was fantastic! A great evening!! A great concert!! Thanks Ed, Ed Jr. and Adam for bringing so much pleasure, memories and fun. Ed, everyone appreciates you and your sons taking the time to entertain and to offer so much joy with your music. Kudos. And a big thank you to Pat Marchand for all her help. Photo courtesy of Bob Katz. Ed is sitting in front, Adam on the left and Ed. Jr. on the right. Remember the days when the Howard Smith Paper Mill had Visitors Day? Some of us kids used to make sure we went. It wasn’t to see how they made the paper and all the machines so much…more because they gave out free packages of coloured paper. It was wonderful to take a big package home. We could have lots of fun with that: drawing, coloring and writing stories. Big treat to a kid. Actually it would still be a treat. Some kids never grow up, eh? Bob Katz, a local senior, has a fascinating hobby: Palaeontology, among others such as also being a History buff. 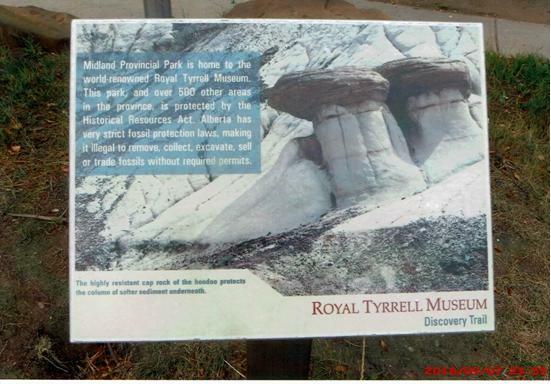 He travelled with his daughter and family recently to the Royal Tyrrell Museum of Palaeontology in Drumheller, Alberta. The museum, besides being a big tourist attraction is a centre of Palaeontological research with a collection of over 130,000 fossils, according to their web site. They visited the Badlands and Hoodoos which are rocks and stone formations, some resembling huge mushrooms which were worshipped by the Blackfoot Tribe thinking the mushroom formations were gods, apparently. Bob also learned some interesting history of the Blackfoot Tribe and their migration to that area about the 1700’s. Photo of the Hoodoo rock formations. 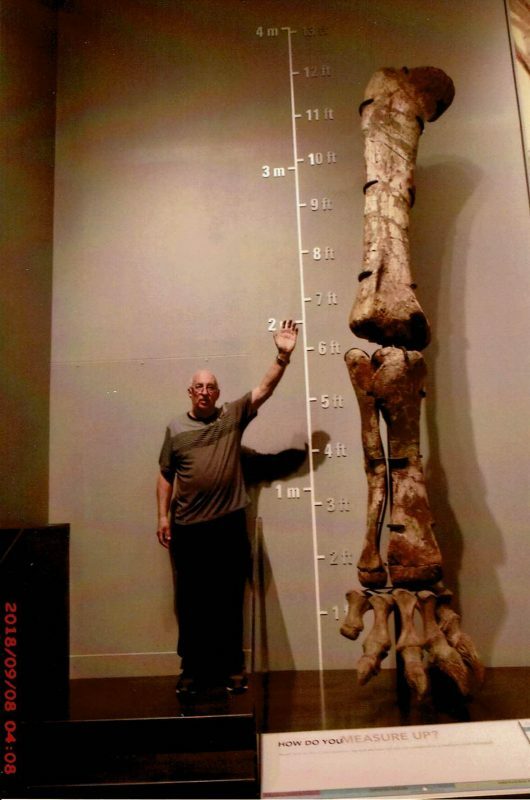 Here is Bob standing beside a huge dinosaur leg bone. Bob and family also visited the War Museum and the Aeronautical Museum in Calgary. At the Aeronautical Museum he saw the first airplanes built by the Wright Brothers and also the early war airplanes. He said that each item he saw was of major interest. He and his family covered a lot of early history of man in a day and a half. Bob took a lot of photos which he is busy sorting and putting into albums that will be of great interest. Bob said that it was a trip of a lifetime and one he will never forget. His photos will help keep the memories alive for him of his “trip of a lifetime”. 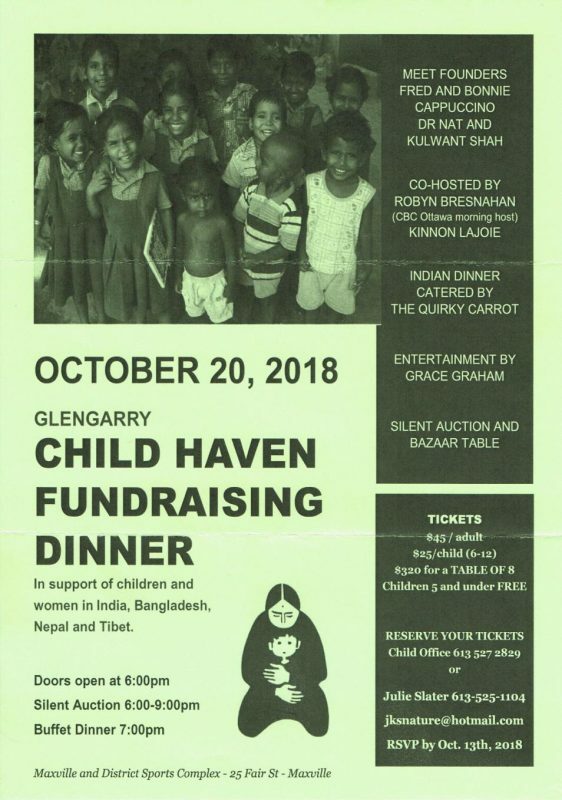 Child Haven International is holding their Glengarry Fundraising Dinner at the Maxville and District Sports Complex in Maxville on October 20th, 2018. Please call by Oct. 13th for reservations at the Child Haven office 613-527-2829 or Julie Slater 613-525-1104 or jksnature@hotmail.com. Cost is $45 /adult, $25/child (6-12), children under 5 free and $320 for a table of 8. Child Haven International was founded in 1985 by Fred and Bonnie Cappuchino and Dr. Nat Shah to help orphaned and destitute children and women in need of food, clothing, health care, education, moral and emotional support. There are ten projects in four countries: Tibet in China, Nepal, India and Bangladesh. Beek Lindsay Residence is holding their annual Thanksgiving Food Drive to benefit the Trinity Anglican Church Food Cupboard. It is wonderful of the residents to share with those in need. 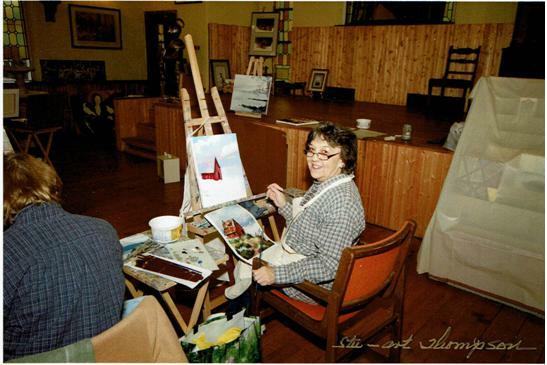 Here is a photo of Marie Greffe (left) and me painting some years ago at Sue’s Art Gallery, which is now closed. It was a wonderful spacious area for painting lessons. Our teacher was Bonnie, daughter of Jean McCormick, a well known local artist. It was Jean who convinced me to give painting a try in the late 80’s at her studio on Pitt Street North. I have always been so grateful for her encouragement. This painting I was doing was of a shack on a cliff edge on the California coast. Apparently it did fall into the sea. Su Thompson, who was painting with us, took the photo and her husband, photographer Stuart Thompson, who died recently, developed it and sent it to me. 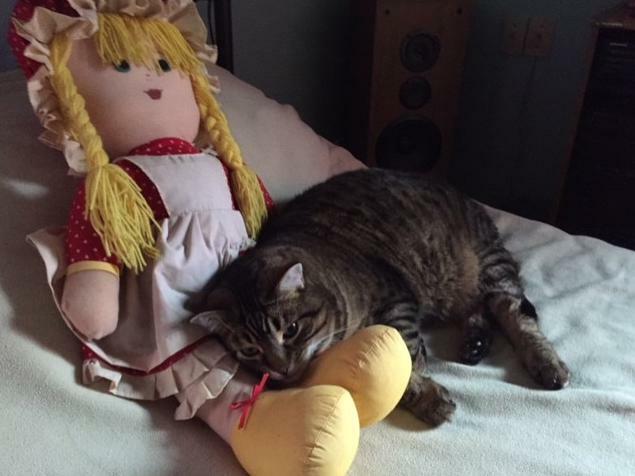 My sister Evelyn’s cat “Rocky” loves to sleep on her old Raggedy Ann doll and cuddle up to it. Very cute. Prince Phillip: When a man opens a door for his wife, it’s either a new car or a new wife. W.H. Auden: We are here on earth to do good unto others. What the others are here for, I have no idea. Steve Martin: Hollywood must be the only place on earth where you can be fired by a man wearing a Hawaiian shirt and a baseball cap. Jonathan Winters: If God intended us to fly He would have made it easier to get to the airport. Robert Benchley: I have kleptomania, but when it gets bad, I take something for it. John Glenn: As I hurled through space, one thought kept crossing my mind- every part of this rocket was supplied by the lowest bidder. David Letterman: America is the only country where a significant portion of the population believes that professional wrestling is real and the moon landing was faked. Old Italian proverb: After the game, the King and Pawn go into the same box. And one from our beloved Jimmy Durante: Home cooking. …where many a husband thinks his wife is. Dawn you might remember this from way way way back in the early 50’s about a man by the name of Eddie Katz who ran some sort of news in Cornwall and I think it might have been on 11th Street back then. I remember one of my much older sisters talking about him. I am trying to think way back as much as I can for some memories. Dawn I just had to put my old thinking cap on and it was called the Brian or Bryan News on 11th Street way back in the 50’s era. I have to take time to try and remember these things and they are coming back slowly. Cornwall was alive back then but today it is a literal grave yard. We haven’t been back since we purchase the car from Toyota in Cornwall and we still have the car and excellent. Jules: The Cornwall News Distributor was on 11th. owned by Ed Bryan and Eddie Katz was the manager. Later, Eddie Katz owned a stationery store on 8th. St. W. Eddie Katz was Bob’s uncle. Dawn I remember that stationary store on 8th St. and Cornwall is so small. LOL LOL. Yes I remember that. Dawn I remember going into that stationary store on 8th St. W. near Cumberland St. once. I think that the stationary store catered to businesses. 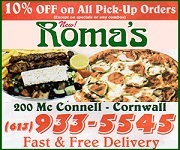 That was going back to the 1960’s when I popped in – a long time ago. Dawn I saw your sisters cat Rocky and he looks so much like your Tiger. So cute.